You have probably seen her around the Science Complex – headphones on her ears, running sneakers dangling from her backpack and a big smile on her face. Friends joke that Elizabeth “Biz” Egan lives in the Mathematics Department, and based on the amount of time she spends there, it’s not far from the truth. “Tutoring is the best part for me because not only do I get to tutor math classes I truly enjoy, but I also get to interact with other students and tap into my love of education too,” she adds. Becoming a teacher had never been a question for Egan. “I think growing up I was one of the only kids around who had a daily countdown until the first day of school rather than a countdown to when summer was going to begin!” she says. “My parents have always stressed the value of education and instilled in me the idea that being a good student was my job, a job I should take pride in.” Ever since those days of “playing school” in the basement, she knew the classroom setting was where she belonged. The math part came later. Sure enough, mathematics here at the College is no joke. Unlike some School of Science students who spend their time researching in a lab, Egan is out in the field flexing her teaching wings. Currently she is at Dunn Middle School in Trenton, where she says the students’ energy and enthusiasm matches her own. With the added challenge of keeping the children motivated and interested, Egan has honed the skill of being both an educator and an entertainer. But teaching mathematics is more deeply rooted than conveying procedures and example problems for Egan, it is a well-rounded mathematical education. College is the time to discover where your future is headed. Some students change career paths once, twice or more. But Egan seems to have found her calling. 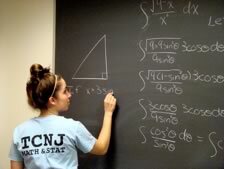 Back at TCNJ, Egan approaches each day as a learning opportunity and is fully dedicated to her own studies. She feels these qualities are instilled in the students here under the guidance of the Math and Statisics professors. 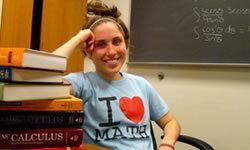 When not in class, Egan devotes her time to her position as co-vice president of the Math and Statistics Club, as well as serving on both the School of Science and Department of Mathematics & Statistics student advisory boards. In both roles, she says her goal is to make the department feel like a community.